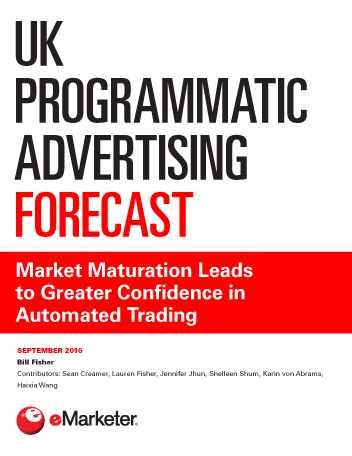 The UK remains a market leader when it comes to trading digital display ad inventory programmatically. Because the market is relatively small and players on both the buy and sell sides are keen to experiment, the programmatic landscape in the country has become sophisticated enough that many are now willing to play in this space. The UK programmatic display ad market will be worth £2.67 billion ($4.08 billion) this year, up 44.0% from 2015. This year, programmatic direct will reach parity with ad spending via real-time bidding (RTB), then surpass RTB for the rest of the forecast period. Mobile has grown up in the programmatic era and, as a result, an even greater proportion of mobile ad inventory is traded programmatically than for the overall market—79% in 2016. RTB’s influence is being more keenly felt in mobile, as the overall market is moving to mobile faster than social’s influence—and, hence, programmatic direct’s proportion of total spend is coming down slightly. Programmatic video is seen as a big growth area, but given the relative lack of premium inventory currently available, it will remain a little behind the curve—just 51% of digital video inventory will be traded programmatically this year, vs. 70% for the overall display market. "Growth in programmatic digital display ad spending will remain strong this year and reach £2.67 billion ($4.08 billion). This will represent 70.0% of all UK digital display ad spending, a proportion that will pass three-quarters next year."